To begin making Shakarkandi Ka Halwa Recipe(Sweet Potato Halwa), in a plate, peel and grate the sweet potatoes. Place a Kadai on medium heat. Add ghee to it. Once the ghee is warm, add grated sweet potato and saute till the sweet potato softens. Add sugar, cardamom powder and nuts, mix well, keep stirring and cook the Halwa for 2-3 minutes. Keep a few chopped nuts for garnishing. Serve Shakrkandi Ka Halwa Recipe hot for breakfast or pack it for kids snack box. 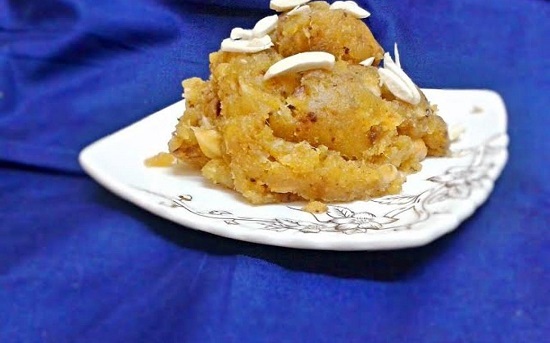 Shakarkandi Ka Halwa Recipe(Sweet Potato Halwa) is an easy and quick sweet dish. Softened sweet potato with crunchy nuts give a good texture while cardamom gives it a nice aroma to the recipe. It is a great recipe for breakfast or kids snack box.